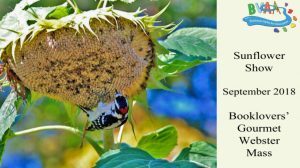 Our September 2018 Sunflower Show celebrates the sunny beautiful flower! The art show features works in various media including photography, paintings, and mixed media by members of The Blackstone Valley Art Association. It also complements the massive garden of live sunflowers which the bookstore is famous for. Come on out to admire the live flowers, appreciate the artistic versions, and explore the shop’s offerings! A meet and greet with the artists will take place on Saturday, September 8th from 2-4 p.m. Please note: The store will be closed for vacation September 10-15. Error: Error validating access token: Session has expired on Monday, 08-Apr-19 19:39:38 PDT. The current time is Wednesday, 24-Apr-19 09:30:56 PDT.